This is his expanded version of his previous book which could be called Artist Beware Lite ! This one too has had a number of editions. And is currently being used as higher education text book. For artists and art teachers, as we are more ever moving to a more litigious society. This is divided into two parts: The first is Chemical and Physical Hazards, basically the first chapters discuss what and how the materials you use can hurt you and what bodily systems they affect and how. Since as with most things that would cost industry money, there is still some controversy about the role that industry played in setting them. So all three are included if the last two are lower than the TLV. One interesting thing you may want to consider if you are in an art studio work place. Don’t call OHSA as it doesn’t do studio’s or art work places. And since the industrial limits are higher than for studio’s they may just give the work place no violations! Which means they then could state that OHSA has given them a clean bill of health. Given are the chemical names, common names if so are used, flash point, Specific hazards along with general hazards and general uses for the class of material. If there is need for further detailed explanation it is also given. The next 5 chapters deal with Safety in the work place or studio. general safety, ventilation lots of great info most don’t know or things that we don’t consider. 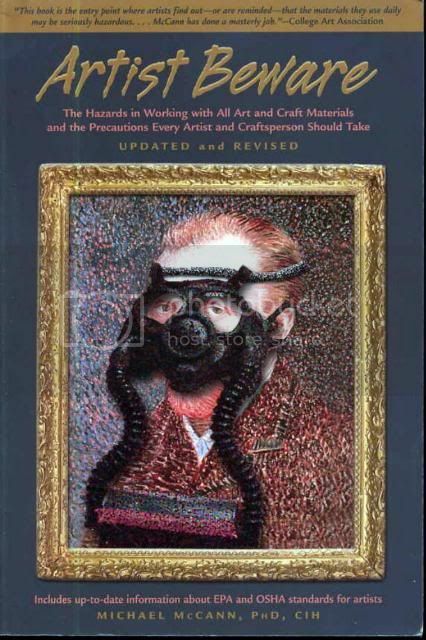 Using flammable and toxic art material safety. And the personal protective equipment, and some of it will surprise you as it has to do with things that aren’t really discussed much. Noise in the studio/shop two examples are hammering on metal @120 decibels, and portable grinding 110 decibels. Another item that isn’t talked about much is, Infrared Radiation emitted by heated objects. Whether somebody is at forge side glass blowing or hot work kilns, foundry. It has been known as potters cataracts, or any other names down through the years. Head gear for bump injuries, proper clothing, the proper shoes and then if you use ear plugs and do welding or anything were sparks are generated they should non flammable as not to cause more damage to the ear. It also Goes into ergonomics, tool and machine safety then finishing up with the physical hazards. And finishing up with in case of illness or injury who do you call. As most regular GP’s will not have a clue about what to do or which test to call for. Things most of us have never given thought to or about. The second part again covers the: Assorted art and Craft Techniques from painting, drawing, sculpture, wood, metal, smithing, glass, enameling and jewelry among others and finishing out with children and art materials. Each craft is then listed out as to hazards and then precautions, and if need be broken down further to separate subject matter in the craft. It has a great Bibliography and good index. Again check for the latest edition, as the information changes as new research comes to light.